1994; 320 pages. Genre : Crime Fiction. Rating : B-. Stephanie Plum needs a job, so she schmoozes her cousin Vinnie and gets hired on as a bounty hunter. Unfortunately, she knows nothing about the vocation, so she needs a gun, needs to learn how to shoot it, and needs to figure out how to haul someone in. Most of all, she needs the $10,000 finders fee for bringing in Joe Morelli; who's a cop accused of murder, a hunk, and who as a kid, conned Stephanie into playing the New Jersey equivalent of "doctor". 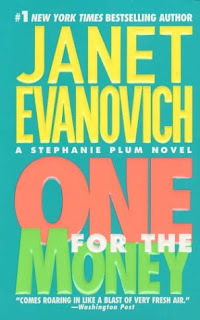 Evanovich has created a strong, female protagonist in Plum. She can use her brain, which comes in handy as she learns her new profession. Indeed, it was refreshing to see her outfox Joe Morelli in order to bring him in, instead of having to resort to her feminine wiles or (worse yet) romance. There is vein of light humor that runs throughout the book, and wonder of wonders, we're not dealing with someone who suffers from job burn-out. It's also a nice change to follow a bounty hunter instead of a cop or detective in a crime novel. Morelli is another good character study, although it is evident early on that he's not really a murderer. Unfortunately, the great character studies come at the expense of a humdrum storyline. Stephanie gads about, searching for Morelli and bringing in easy, but low-paying bail-jumpers. Meanwhile, no progress is made on the main murder until the tail-end, when the real killer of course blabs all the details to Stephanie right before he intends to kill her. Don't bad guys ever watch Austin Powers movies? There are believability issues. The entire New Jersey police force can't find Morelli, but Stephanie manages to do so - not once, not twice, but four times. Then there's her visit to a boxing gym, where the "champ" decides to attempt to sexually assault her for no particular reason and in front of everyone else working out at the gym. Yeah, like that happens all the time. The Stephanie Plum series has been highly successful for Evanovich, and I noted that the latest one (something like #15 or so), "Plum Spooky" was #1 on the NY Times best seller list last week. It may be interesting to see how her character develops along the line. Persumably, she gets more adept at bounty-hunting with time. If you're looking for an entertaining story, with a bit of humor and a good, strong, thinking female lead, One For The Money may be your cup of tea. OTOH, this isn't the book to read when you're wanting spine-tingling suspense or wish to solve a whodunit alongside the protagonist. As long as you're more interested in what happens to Stephanie and her bounty-hunting than who-killed-who and why, this is a pleasant read. I first saw an Evanovich book when on a flight to NYC. I think - but I'm not sure - it was Plum Lucky, it looked about 100 pages long, and the font was like 16-pt in size. It looked like it wouldn't have been above 40k words and I wondered how it was getting published as a novel. Soon after, I began to see lots of women reading Evanovich books in cars while waiting to pick up kids at the school. At the time, from the covers, I thought they were like Danielle Steele books, except harder, brassier, and maybe quirkier. But just as forgettable. Airplane books, as you termed them before. It's interesting to find out they're detective, but I'm still not in the least bit tempted to give her a try. Something about her (and the volume of books, I imagine) turns me off. I'm sure that makes me a total snob. I need to enter snobby-readers anonymous, yes? Good review. It sums up the series utterly. I like Stephanie Plum, but the men are awesome! Morelli and Ranger, ah, delicious..hmmm. I've read every book in the series - the 15th comes out this summer. Books 2-6 are the best, with each one after that becoming just more of the same, all bland bean burrito. The spice is lost by book 7, but you should try Two for the Dough. The story and the sexual tension are mucho better! If you care about that sort of thing. heh, Lula. i forgot to mention Ranger. he seems more interesting than Morelli. Amanda, i was surprised that 1FTM didn't have more romance in it. i suspect that's coming in the sequels. IIRC Evanovich also writes a chick-fic series. i should mention in closing that one of the characters in the book is named Lula, an obvious tip-of-the-hat to the influential 5-Squared blog. I have not started the number novels...but I've been enjoying the between-the-numbers novels on audiobook. I think I enjoyed this better than you did. I've been waiting to catch up on the series this year, but there are too many other books demanding my attention. kewlness, J. Kaye! it's always interesting when people have varying opinions of a book. what did you like most about 1FTM? I love Grandma Mazur, and that old Buick. maybe our views match up pretty close then. the dialog is good. the wit is excellent. and the characters - at least the good guys - are superb. it's only the storyline that is mediocre. maybe i'm spoiled because the previous murder/mystery i read was great. and i agree - Grandma Mazur is fantastic. i fully expect her to whop some bad guy upside the head with her purse somewhere down the line. hamilcar barca ~ I can see where the storyline would be considered mediocre. Maybe the dialogue and comedy overpowered the minuses? Personally, I don't like funny books, but I can't seem to get enough of these.